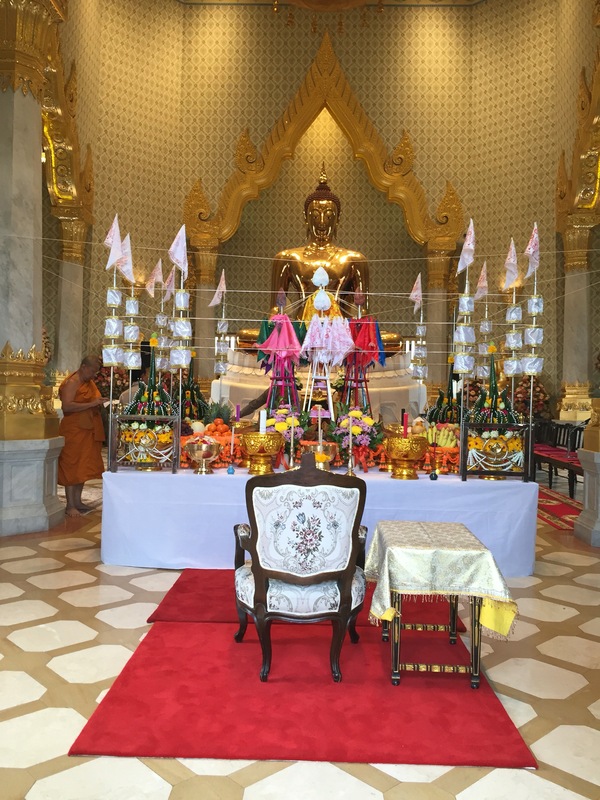 Asia Trip 2016 – WK 2 – PINKKLOVER. Woke up bright and early to enjoy the wifi in our hotel room as well as to get ready to have some food. For breakfast we ate in the hotel as we get complimentary breakfast for the days we’re staying at this place. The food was quite enjoyable and the staff was very hospitable, serving us water, orange juice and a choice between coffee and tea. 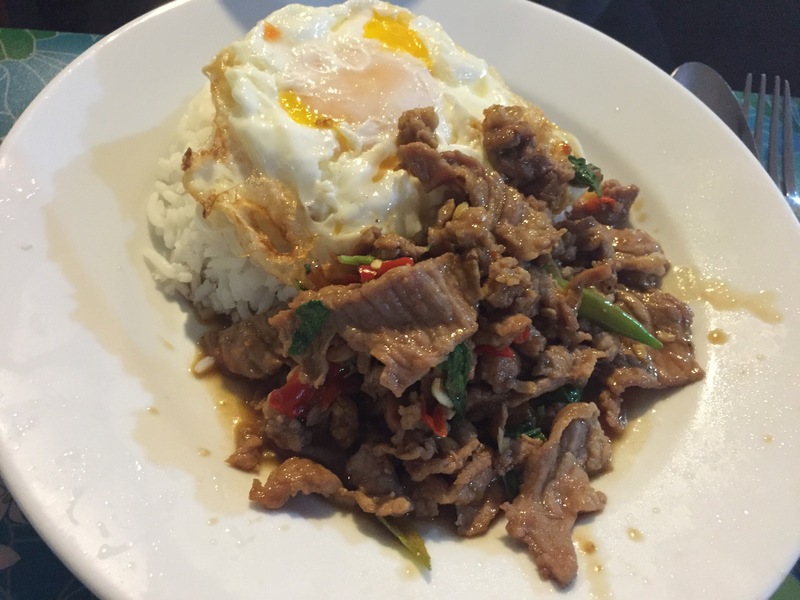 stir fried pork & basil with rice – very spicy but yum! I also went for a haircut (cut, wash and blow dry) for 300 THB which is roughly $12. 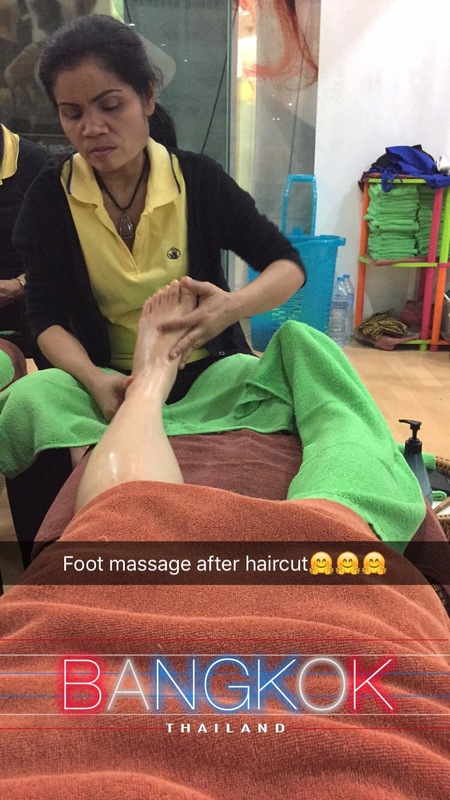 Then immediately went for a foot massage which I think is part of the hairdressers. 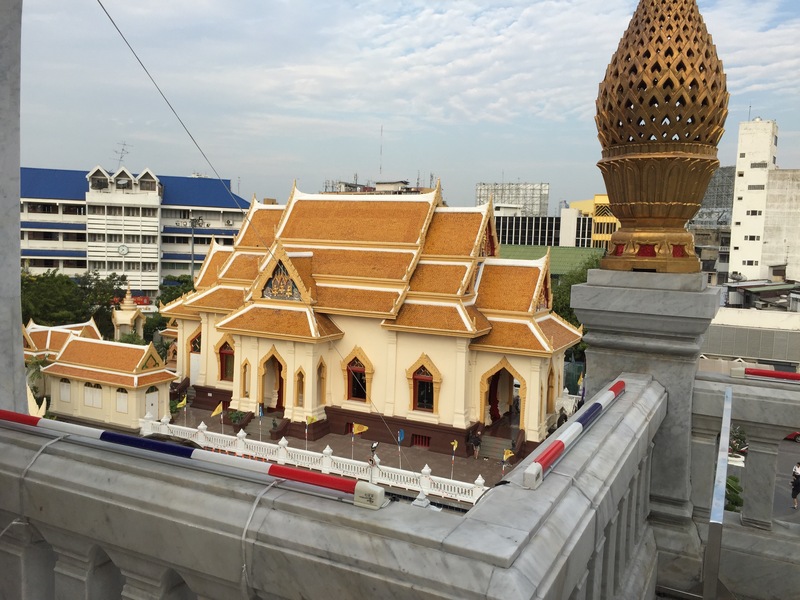 It was so worth it in terms of pricing as I paid 250THB ($10) for 60min leg & feet massage. It wasn’t as painful as I thought it would be but it was good enough to relax my feet and give it some rest after walking for so long hehes. 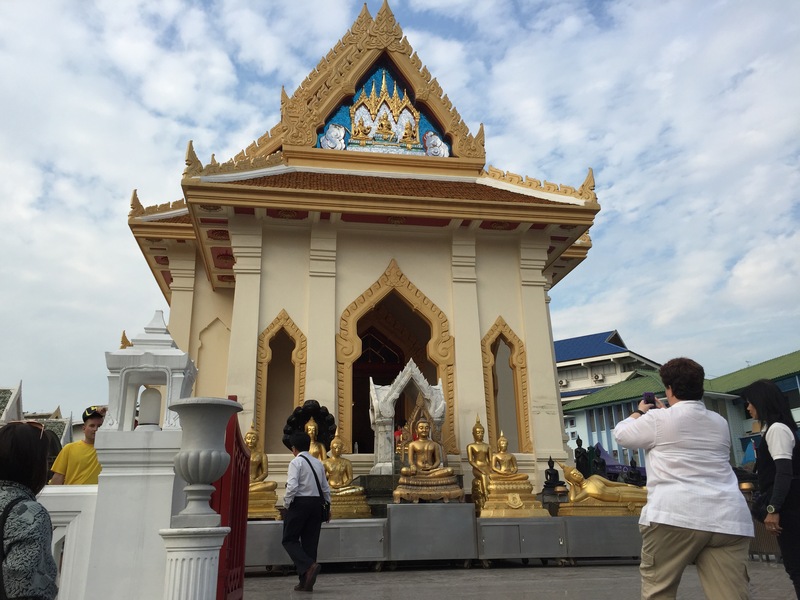 We also visited a temple at Chinatown after lunch and it was spectacular. However the day was pretty chilly and windy so my hair was pretty much flying covering my face when trying to take a photo 😞. After dinner (ordered takeaway food and ate in hotel) we went straight to the night market which was around 20min taxi ride. 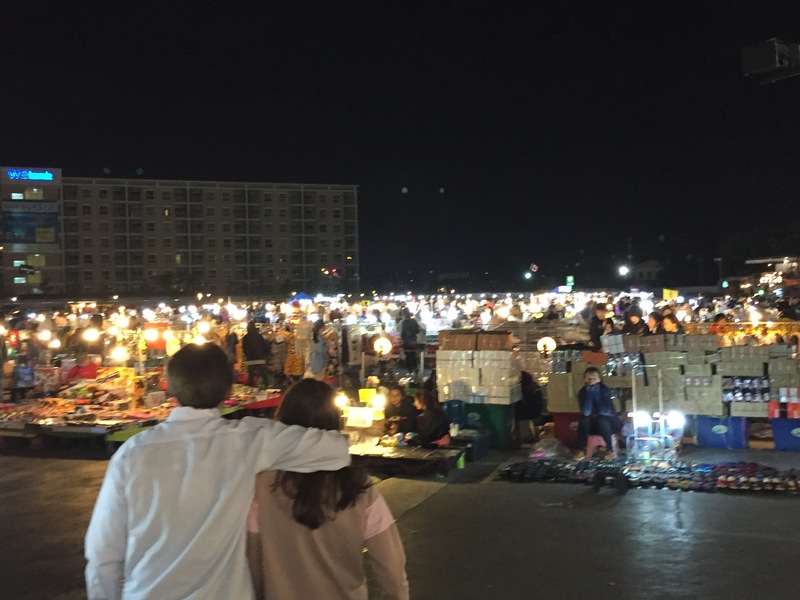 First ever night market in Thailand and this place was pretty big. Despite the fact that it was pretty cold, I enjoyed my time and got to buy quite a few things at a relatively cheap price. They also sold food, electronics, accessories and clothes. Tuesday 26th January: AUSTRALIA DAYYYYYY!!! Had a really good night sleep and watched 2 episodes of dramas before going downstairs for breakfast. 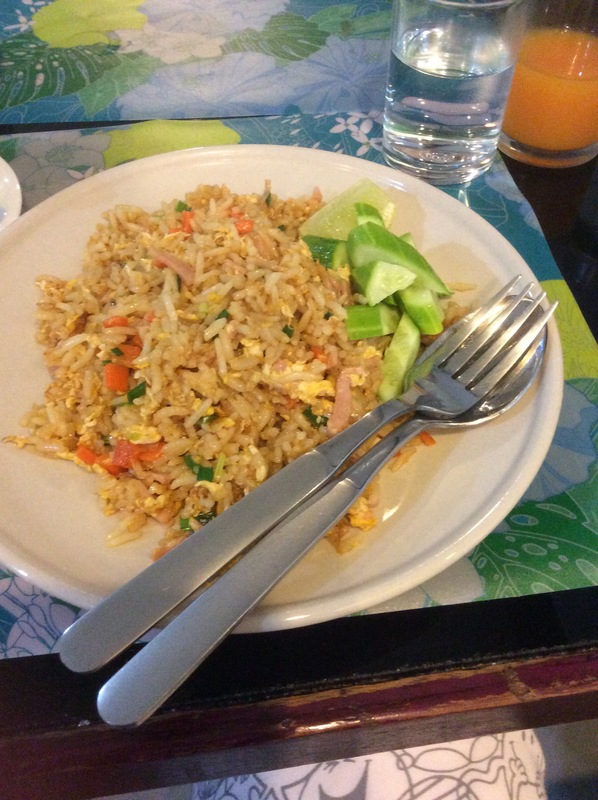 Today I chose their chicken fried rice as it looked very appetising! 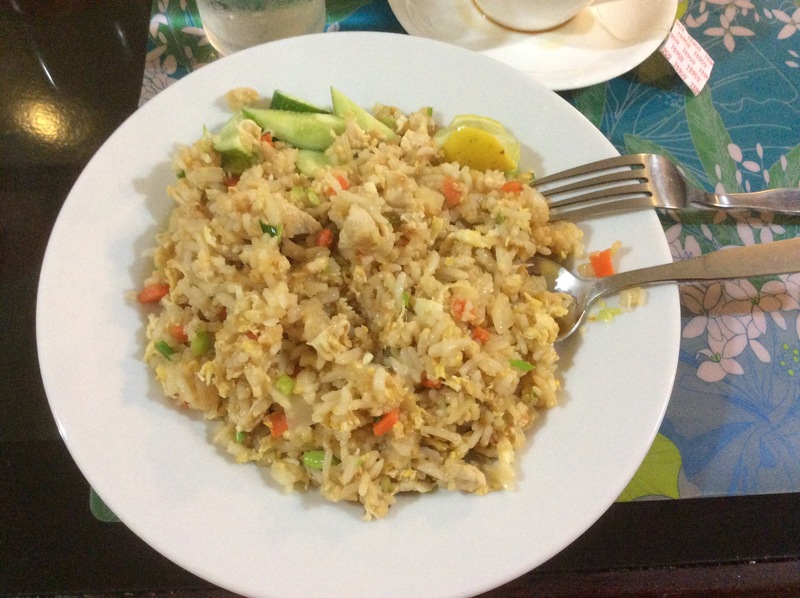 The fried rice was good but wet….quite wet. Nevertheless an enjoyable breakfast. 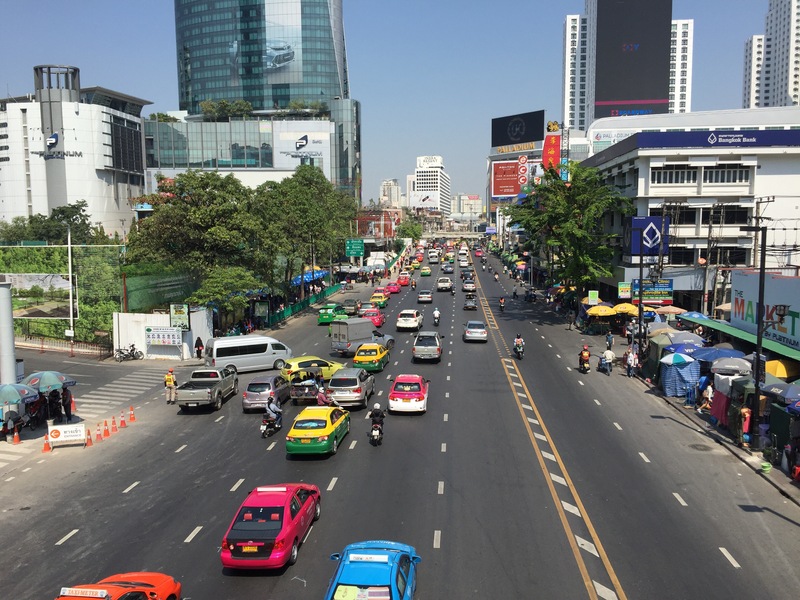 After that, I showered, changed and got ready for a big day of shopping at Siam. 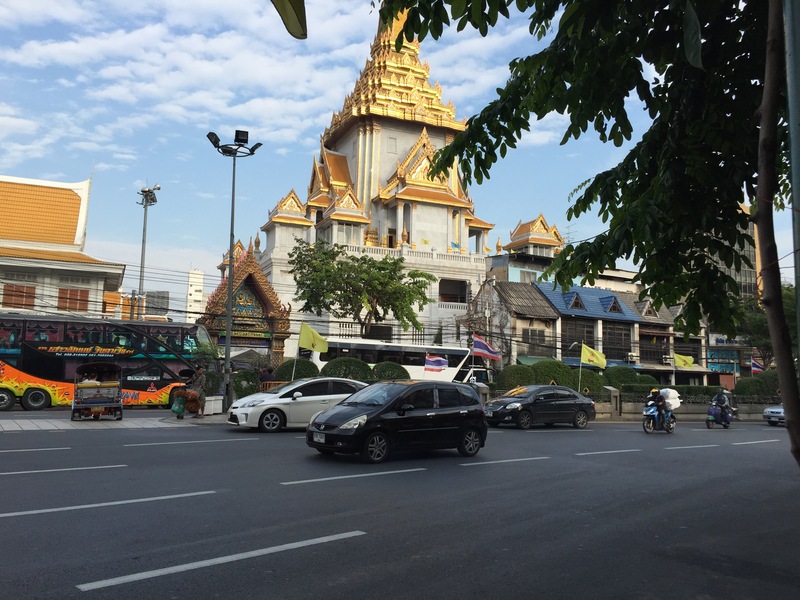 I thought there would be plenty of shopping for me to do at Siam Central but was disappointed. Not everything appealed to me and since I’m around AUS 10-12 in size, not all the clothes can fit me. So we walked out and strolled to MBK again as I wanted to buy more stuff from there. This is what I call good shopping as I bought quite a bit of stuff and even had another massage! Of course, we get quite hungry and tired from walking around bargaining for good prices and carrying our stuff so we went to eat at their food court on the 6th floor(they have 2 food courts). 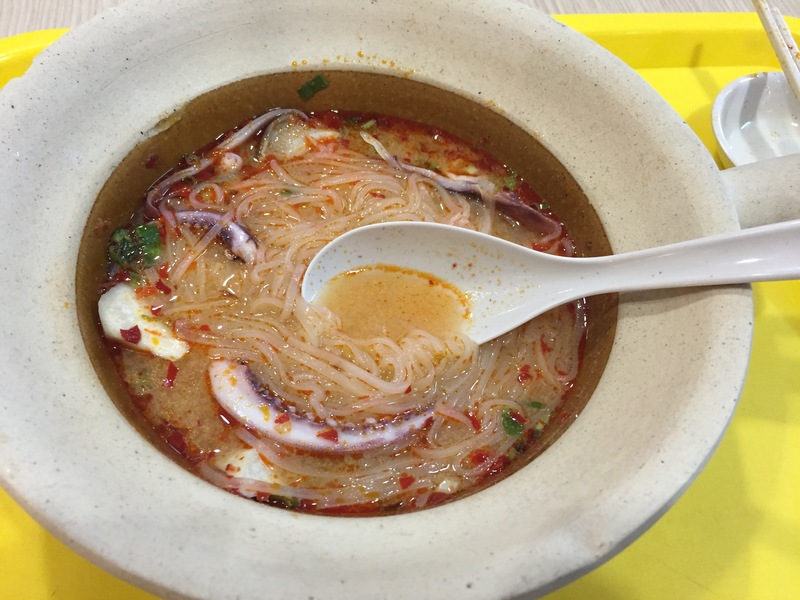 I ordered a Tom Yum soup with squid as I was craving for a good soup and it delivered! After refreshing ourselves, we went back to shopping and eating snacks at this mango dessert store. before dinner at a roadside place. Very local cuisine and delicious! 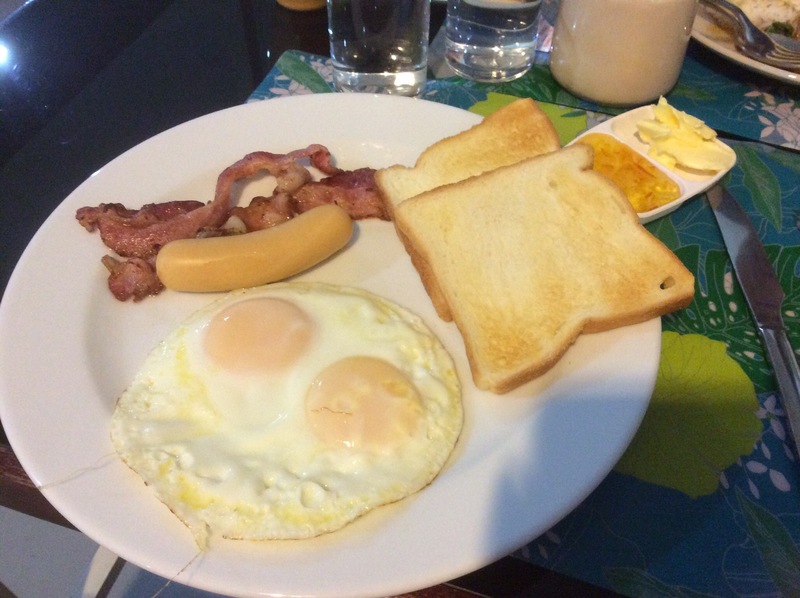 Ordered a set breakfast fried egg which consists of 2 toasts, bacon, sausage and 2 fried eggs =) YUM! As the others were getting quite tired, I reluctantly went to have lunch with them before moving on to Platinum Mall for more shopping. Here, I purchased footwear which are unique and I won’t be able to find anywhere else. However, I didn’t want to buy much as I know my feet won’t be too comfy with those type of shoes. Unfortunately, shopping malls open from 10am onwards so it was a desperate rush to get everything we want to buy and eat before we check out the hotel by 5pm. So, we shopped and shopped..and shopped until we realised that we need to have some dinner before the trip to the airport. So our dinner was quite rushed but eventful as we said goodbye to the wonderful hotel staffs who were so friendly and helpful! We quickly loaded our luggage into the taxis as BKK traffic is crazy! Usually, it would take around 1 hour to get to the airport whereas if there were no traffic (sometimes), it would’ve taken 20mins. Woke up to the familiar humid air but it felt nice to be with family again. We had a clean and healthy brunch to cleanse our stomachs (and bowels) from the oily and fried food we had in Thailand. After that, we hurriedly packed and repacked our luggage again for the next leg of the trip to Malaysia! 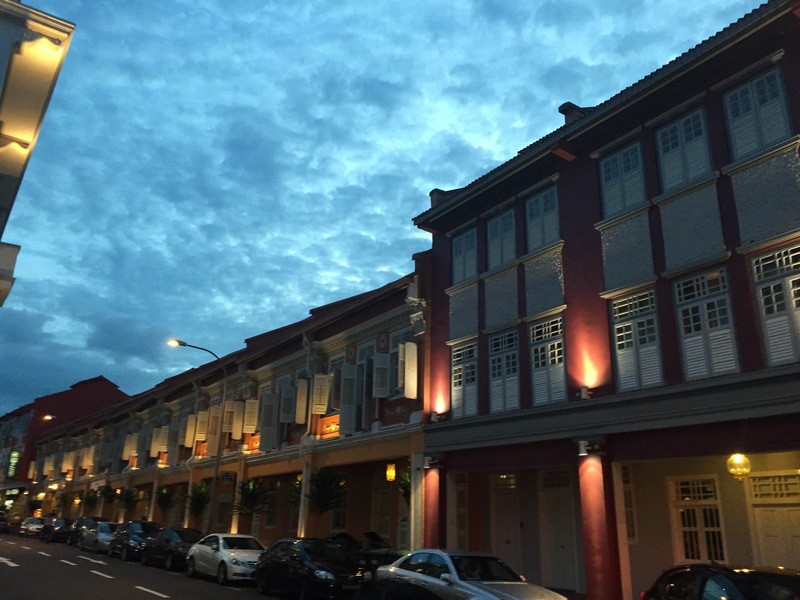 I am excited and can’t wait to have authentic Asian food at Penang & Ipoh (must-go-to places for food!) and from looking at the pictures posted by friends and family, I’ve been salivating! We’ll also be going to KL for a one night stay with friends who will take us around for sightseeing and more food! For dinner we went to a big Hokka centre near Beauty World MRT station. Their food is amazing! So many choices and cravings fulfilled! Spent the whole day with one of our fave uncles XD food hopping from different Hokka centres as he brought us to various places to try local favourites. For breakfast, we went to Jurong East Hokka centre for wanton noodles and gosh thank god we were there early or else we would’ve been at the end of the queue five minutes later which would’ve been around 30mins of waiting, minimum. The wontons are the best I’ve tried in Singapore and I love their char siew which was cooked with charcoal and is packed with loads of flavour. The soup was good and loved the egg noodles! For lunch, we had a really really good chicken rice at another Hokka centre near Queenstown. The chicken was so tender and the best thing was the crispy skin! Rice was flavoursome and I really enjoyed my lunch. Definitely better than the one I had on my first day in Singapore! There are also lots of good desserts especially if you’re into Chinese sweet dessert soups. Also, there’s this store selling freshly made ropiah skin which not many people can do in Singapore as its a very traditional skill. Here’s a video of their amazing work! For dinner, we travelled all the way to Chinatown as we met up with friends and had a great dinner with family members as well. My uncle brought us to this big Hokka centre known for its charcoal clay pot rice. WOW! A must try dish when you’re here in Singapore! We also had sambal sotong, leatherjacket and prawns which were all quite hot but again, full of flavour! 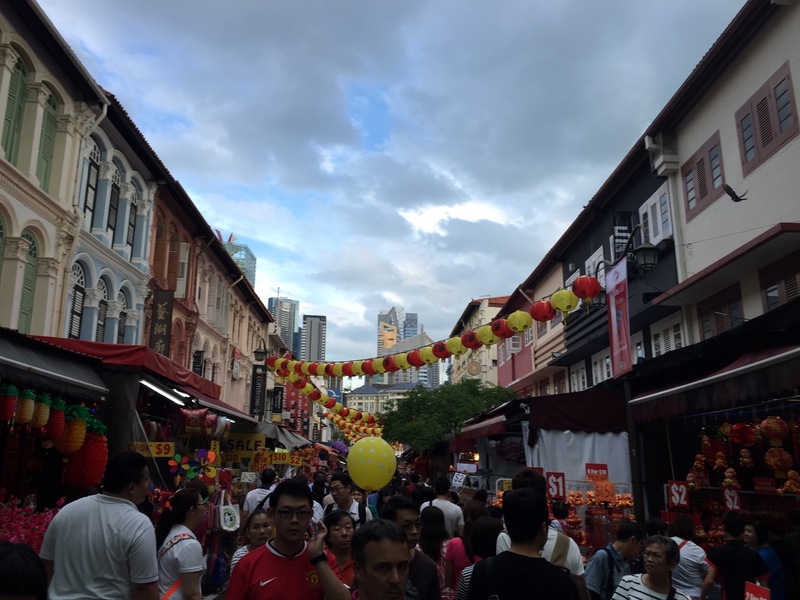 Love Singapore!As its a busy season with Chinese New Year drawing near, the streets in Chinatown are crowded and packed with people buying food and gifts for New Year. Again, there’s lots of food to try and see as well as sightseeing the wonderful streets decorated with Chinese New Year festivities. Unfortunately, we couldn’t stay too late as we had an early flight to catch the next morning to Penang. Woke up rather early around 5:30am to finalise everything in my bags, grab a shower, get changed and call a ride from the “grab taxi” app to the airport. This is my second time using this type of service and so far they have all been pleasant experiences. It’s similar to Uber in a way. We arrived at the airport just in time to check in, have breakfast, go through customs and the numerous bag checks prior to boarding the flight. The plane was rather small but comfortable inside since it’s only a short trip around 1-2hrs flight. I took numerous photos of the spectacular view and it’s so amazing to have this type of view up in the air. 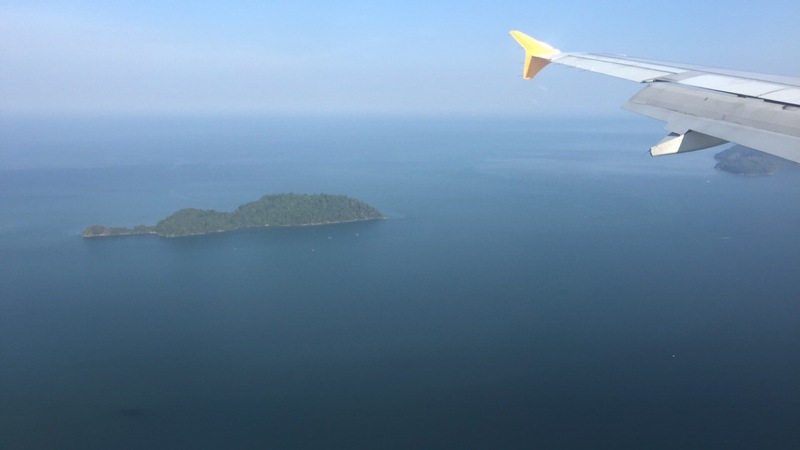 When we arrived in Penang, immediately I noticed the difference between the heat in Singapore and Penang. Singapore is rather humid so you’ll be prone to sweat whilst Penang heats you up like a fried chicken! We had brunch nearby our hotel as there’re so many food stalls with plenty of choices to choose from. I ordered a chao kway teow as it has been so long since I had a really good one! Love it and it filled me right up! There were also other places where we bought some snacks and drinks, I’m so glad we live so close to food!! Other than Georgetown, we also travelled up to the Jetty where there was this amazing view of the harbour and the sea. Then for dinner, we went to this huge courtyard place where there were many stalls selling FOOD FOOD FOOD! 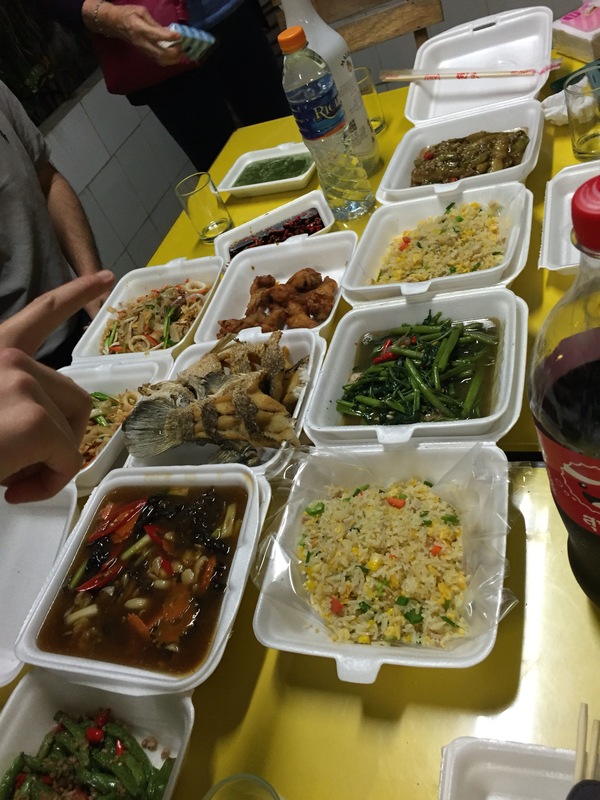 We ordered laksa, some noodles, frogs legs porridge (pretty nice), rice dishes and some local delicacies! After all that, it’s safe to say that we were full! 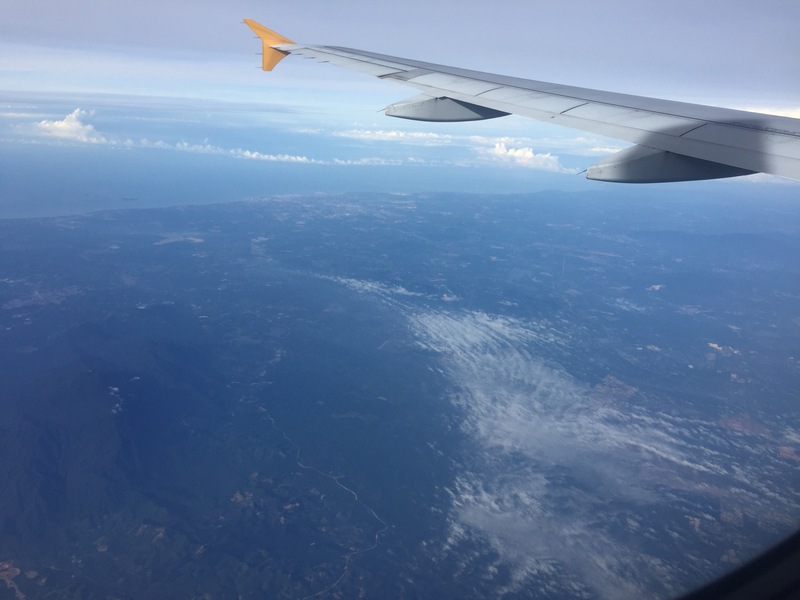 Pingback: 2016:CNY Travels | PINKLOVER.